Rockville, Maryland, Feb. 11 – With more than thirty years of experience in nonprofit fundraising, David Belkin has been asked many times about the processes he relies on to convince potential donors to invest in a cause. But, as Belkin puts it, fundraising does not involve any secret techniques or magic phrases, but rather one’s ability to utilize empathy. 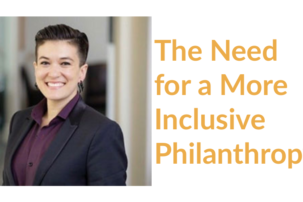 Empathy in fundraising does not require technical skill, but it does require the ability to listen to a donor’s goals and interests, not only to establish a connection with them, but to help the donor feel a connection to the fundraiser’s cause. Belkin’s time in the nonprofit sector has taken him from one high-profile job to another. In all these positions, Belkin has been involved with nearly all aspects of fundraising, ranging from capital campaigns, endowments, planned giving programs and grant seeking. 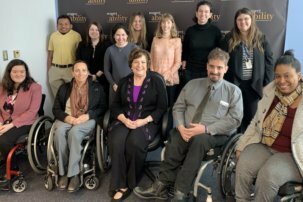 Because of his experience, Belkin was asked to address the Spring 2019 Fellows Cohort of RespectAbility’s National Leadership Program to discuss how to use empathy to attract donors. Belkin defines empathy as “a path between me and you.” Fundraising is built on relationships. Empathy is the foundation to building those relationships, because it involves two people who would ordinarily have been strangers to one another sharing their perspectives to create a connection. Convincing people to donate is not about selling a product, but rather an idea, and the best ideas often convey feeling, compassion and meaning. However, it is incorrect to assume that fundraising is all about the pitch. To sell an idea, it must match the donor’s interests. Learning that information involves the most important aspect of using empathy: listening. Many donors often contribute to a cause that has personal meaning to them. If a fundraiser takes the time to allow donors to speak and express themselves, the more they will learn about each other. Belkin described an experience where he spoke with a prospective donor whose son-in-law had become disabled after an accident. Since then, thedonor had been using his resources to provide for his family’s wellbeing. Having taken the time to get a sense of the man’s experiences, Belkin suggested that the donor set up a fund that would be used by families who found themselves in similar situations but did not have sufficient financial resources. This new fund was set up and administered by the Jewish Social Service Agency, which Belkin worked for at the time. After all was said and done,the donor expressed gratitude to Belkin for being given the opportunity to both express himself and to help others and contribute to something that held great personal meaning to the donor. It may seem paradoxical that a donor would be grateful for giving away money, rather than the beneficiary, but Belkin states that there is a relationship between giving and gratitude. When a person is grateful, his or her state of mind becomes more charitable. Empathy is the key to that relationship. The biggest takeaway that Belkin wanted RespectAbility’s Fellows to learn was that the more they engage with a donor about the things that they are thankful for, the more meaningful the dialogue becomes, and the donor becomes more likely to contribute. Through Belkin’s talk, RespectAbility’s Fellows gained important insight into the world of nonprofit fundraising. Fundraising is a relationship that is not as one-sided as people may think. In fact, the donor may need the fundraiser’s help just as much as the fundraiser needs the donor’s. 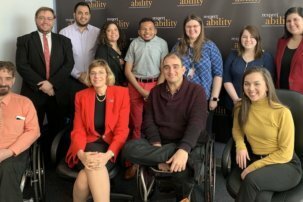 Jeremy Cooper joined RespectAbility out of a longstanding desire to work in disability and mental health advocacy, which stems from his experiences growing up with a younger brother with autism. He is an avid history enthusiast.